This is a commissioned work by Redshrike. Included are 11 sprite sheets setup similar to the other LPC assets (up, left, bottm, right). All variations are of the same spider with different markings and color coats. There are 3 animations included, walking, attacking, and dying (only 1 direction dying). Attribute Stephen "Redshrike" Challener as graphic artist and William.Thompsonj as contributor. If reasonable link to this page or the OGA homepage. Amazing work! What a perfect contribution for the LPC, I will defiantly be implementing these bad boys into my game. Thanks! I have LPC stuff made from time to time. If you watch my profile you'll see new LPC content every few weeks. I'm in the process of making a game in Flash that uses LPC artwork. I've seen some of the preview stuff you've put up about ATOS and it looks really good. I'm interested to test it once you're ready for testers. You can also leave a comment on the thread if you want updates. When I post new LPC content I leave a comment on that thread so everyone who commented gets an email notice. 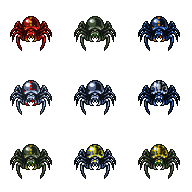 Spiders look great! I'm currently designing a game I'd like to release commerically at some point but am still a litte fuzzy on how the licensing works. Can I use these images in my game or no? Thanks to anyone who knows for sure! Anything on OpenGameArt.org should be usable for commercial and non-commercial use as long as you give attribution. In your credits file you need to list the author and follow any other attribution instructions the asset lists. Aside from that, everything is free to use and we all like to see our stuff in real games if it does get used. What platform (iOS, Android, Computer) can we see your game once it's done? Do you have a demo or screen shots of something currently in development? Right now it is a Java App running on my Windows PC. When I get it to a certain point, I will port it to Android. Been reading up on that. I'll send a screenshot or two when it is nearer completion. Can I use this in my Game....??? Of course. Do you see the "Licence" tags in the left column? That tells you under what conditions you're allowed to use this sprite (click the banner for an explanation of that particular licence). As Evert said, yes. All you have to do is give credit as specified. Can LPC content be used commercially? Excellent, my whole body itches with fear.